Note: As of June 1st 2011, Aced Poker (and the Merge network on the whole) no longer offers rakeback to new players. It has been replaced with their VIP loyalty system, which is available to all new players signing up to the room. Check out the main rakeback poker sites page for a list of the best rooms currently offering rakeback. This step is to make sure that you will get tracked as a rakeback player when you sign up to Aced Poker. It is not essential, but it does help to prevent any possible problems with tracking. Step 1: Visit Aced Poker. Use the above link to visit the Aced Poker website. Make sure you use this special Aced Poker rakeback link to visit the site so that you are tagged as a rakeback player when signing up. Step 2: Use the bonus code BANK10PK when making a deposit. After visiting the Aced Poker room, simply download the software and create an account as usual. When you get around to making your first deposit at Aced Poker, you will be asked to enter a bonus code. Use the bonus code BANK10PK to ensure that you are tracked as a rakeback player at Aced Poker. 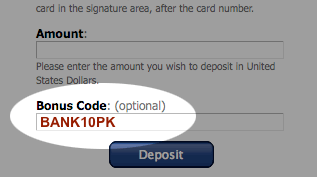 This BANK10PK bonus code will also entitle you to a 100% up to $600 bonus. That's all you need to do to get rakeback at Aced Poker. Feel free to contact me if you have any questions or encounter any troubles! Rakeback payments are made daily - This is quite uncommon in the world of rakeback. Aced includes tournament fees in rakeback calculations, which is something that not all Merge rooms do. Aced is open to US players. The room also has great software, which makes the overall Aced Poker rakeback deal even more attractive. The only downside is that Aced does not receive as much traffic as the major online poker rooms, but this will not cause a problems if you do not play higher than the $2/$4 NL Hold'em stakes. The Aced rakeback deal is a flat . This is the maximum possible rakeback percentage available at Aced and on the Merge network as a whole. Aced Poker uses the contributed rakeback calculation method, which means that rakeback is calculated from the rake taken from the money that you put it in to the pot only. So for example, if you were playing in a $100 NL Hold'em game at Aced and you had put $20 in to the final pot amount, an average of 5% rake would be taken from that $20 ($1) and you would receive of that $1 rake, which will equal 35c of rakeback from Aced. Because Aced Poker uses the contributed rakeback calculation method, you will not generate rakeback from pots that you do not participate in. Aced Poker rakeback payments are made daily. This is a great feature of the Aced rakeback deal, which helps to make it one of the best rakeback deals out there at the moment. The majority of other poker room rakeback deals make payments between a weekly and monthly basis, and so having rakeback payments being made daily to your Aced Poker account for you to play with is a nice touch from the room. Aced Poker does not deduct bonus money from any rakeback calculations. This is another great (and quite uncommon) feature of a rakeback deal that makes Aced a very popular room for regulars to play at. Aced is one of very few poker rooms to not deduct bonus money from your MGR before calculating rakeback payments. So for example, lets say that you redeem $10 of bonus money at Aced by collecting 2,500 VIP points. As a rough estimate this will result in you having generated around $250 in MGR. Instead of Aced deducting this $10 bonus from your MGR, your rakeback will be calculated on the full $250 amount, giving you $75 in rakeback on top of your $10 bonus. Can I get rakeback at Aced if I already have an account? You cannot switch your current account to a rakeback one if you have already signed up at Aced Poker. However, all is not lost, as there are still plenty of other rakeback options out there for you to choose from. Please contact me to see if I can help you find another rakeback deal just as good as this one if you already have an Aced Poker account.